The aim of this study is to investigate the processes involved in the formation of sustainable competitive advantages in the economy of the People’s Republic of China, under the conditions of the instability in the world’s economy. The subject of the research is the socio-economic relations arising in the process of the formation of sustainable competitive advantages. In the current global crisis situation, China is one of the most leading economies in the world.1 At the same time, the relatively successful overcoming of the impact of misbalancing processes in the world by China allows this country to continue its accelerated economic growth.2 And it is precisely the formation of sustainable competitive advantages of a country that gives it the opportunity it to develop steadily under conditions of uncertainty and a decrease in the rate of economic growth.3 In the 1990s, Chinese Government felt the need to enhance and to update their development model. In their first step they set a goal to jump from extensive economic growth to intensive economic growth, So the focus was totally diverted towards increasing productivity, technological and scientific progress etc. In China, the public and private sector were kept balanced by using the principal of parallel development, and is still working till present day. This principal states that; if the efficiency of public sector is high, so it will be preferred while the private sector will be developed more precisely will become more efficient then public sector. With the reforms of 1970’s China became the fastest growing country in the world.4 Due to a number of macroeconomic reforms (Currency control, Public sector, Financial Sector, Taxation, Pricing and Revenue distribution), country achieved high export growth.5 Cross-country comparisons with more developed countries and with the BRICS countries show the most released factors of competitiveness and allow for a detailed analysis of “sustainable” institutions as components of its “economic miracle”. The crisis of 2008 rapidly grew from a local financial to a global economic one, exacerbating the accumulated problems that gave rise to the instability of the world economy. The global crisis has shown a close relationship between the world’s economies and the influence of external factors on the sustainability of their development. Globalization causes instability in the development of the world economy, causing a weakening of the competitive positions of countries, the instability of their development and a slowdown in economic growth. It is revealed that the presence of high GDP does not give the country absolute superiority; this quantitative indicator gives an idea of ​​the scale of activities of national corporations, and not the quality and standard of living of the population, which is a direct indicator of the sustainable and prosperous development of the national economy. Economic growth at the present stage involves improving the quality of products and services, improving working conditions, maintaining a secure environment, improving the institutional conditions of society, increasing the welfare of the population and the transition to an innovative type of development. The scientific category “competitive economy” is interpreted as an innovation-oriented economy with a favorable institutional and macroeconomic environment, a high-tech base and a set of factors to maintain a high level of productivity, forming a unique competitive advantage based on human capital, quickly adapting to global challenges based on real potential and resources, with a long-term development strategy in the context of globalization, open to fruitful international cooperation. Based on the above interpretation, we analyzed competitive advantages in different categories, like education and training, technological progress, macroeconomic stability, effective management, business development, and market efficiency. All of these factors are important for competitiveness and growth and are not mutually exclusive. The stability of macroeconomic indicators is important for the efficiency of business processes and the overall competitiveness of a country, although macroeconomic stability alone cannot increase a country's productivity, it must be admitted that its instability has harmed the economy, as has been seen in recent years. In general, a national economy cannot grow on a sustainable basis if the macroeconomics is unstable. Table 1 presents data on the dynamics of China's macroeconomic indicators, the stability of which ensures the steady economic growth of the country. Source: Compiled by the author based on The Global Competitiveness Report 2009-2018 // World Economic Forum. According to the WEF Global Competitiveness Index, China demonstrates not only the sustainability of economic development but also the ability to increase its competitiveness without slowing down the economic growth rates. China has a positive dynamics of growth factors of competitiveness. National savings still account for about 50% of GDP, China’s inflation rate for the period 2013-2018 is one of the lowest in the world, and the credit rating of the country is high. The positive dynamics of these indicators show their "sustainability". The volume of the Chinese market is one of the main factors shaping competitiveness. According to the WEF till 2016, the size of the domestic market was on the 2nd place, for more than 5 years, the volume of the foreign market took the 1stplace. Thus, China is on the 2ndplace in the “Market Volume” category. In the first place was the United States and in third Japan. But in 2017 China has 1st place in market size index. Market size affects productivity, as large markets allow companies to exploit economies of scale. Through the creation of efficient financial institutions as the State support of exports, China has become a leader among exporting countries. In the year 2017, the share of exports amounted to 20.6% of China's GDP, according to the Global Competitiveness Report 2017-2018 (Table 2). China is ranked 1st place in the world in terms of population, which is a competitive advantage with the right approach to the distribution of labor. The huge population creates tough competition with each other, forcing them to look for ways of self-development, improving their personal skills and qualifications, pragmatically aiming at a specific result. According to the Global Competitiveness Report data for 2017 in the category “labor market efficiency”, China occupied 38thplace (rating 4.5 on a 7-point scale) in the world. These data should be considered as positive, due to the improvement of the effectiveness assessment itself. The main competitive advantages of China in the category “labor market efficiency” are the country capacity to attract talent, hiring and firing practices, and pay and productivity. Figure 1 shows a comparison of assessments of China’s competitiveness factors with the United States, as China’s main competitor in terms of market volume, and Switzerland, which has led the countries ‘competitiveness rating for more than one year in a row. The competition between the USA and China is closely watched by scientists and analysts, prophesying to China the world championship in the near future, because according to the latest data from the International Monetary Fund, released in 2018, China's GDP level of PPP is estimated at $21,2trillion, which exceeds the level of the United States ($18.6 trillion).9 Due to its growth dynamics (about 9% per year according to IMF estimates), China will surpass the United States in a number of other key indicators by 2020.The figure shows that China has the same favorable macroeconomic environment as Switzerland, a high level of health care and primary education, however, is far behind in innovation and technological readiness (Figure 1). 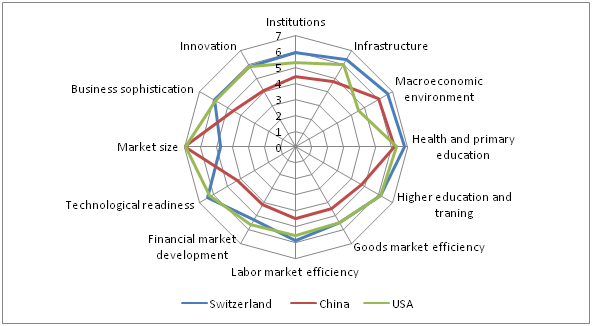 Figure 1 Comparison of the 12 factors shaping the competitiveness of China, the United States, and Switzerland, 2017. Source: compiled by the author according to the Global Competitiveness Report. 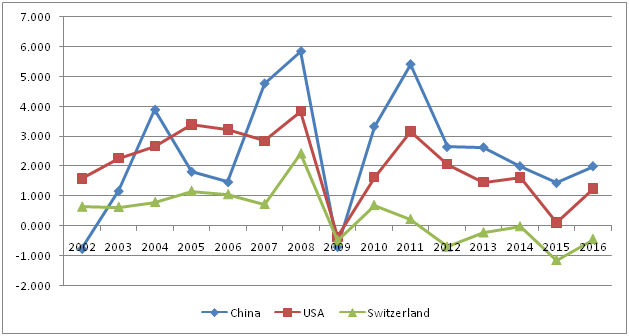 Figure 2 shows the dynamics of inflation in China, the United States, and Switzerland, which has led the ranking of countries' competitiveness for more than one year in a row. Here you can see the peak of 5.9% for China in the post-crisis year and its subsequent decline to 2% in 2015. Through effective monetary policy, China has achieved consistently low inflation, which has become an additional way to attract investment (Figure 2). Figure 2 Dynamics of inflation in China, the United States and Switzerland (consumer prices as a percentage). Source: Compiled by the author from the data of the annual reports of the Global Competition Index of the WEF. Based on the foregoing, the main economic factors for the formation of sustainable competitive advantages of the Chinese economy are the high rate of capital accumulation, the largest gold and foreign exchange reserves in the world, the export orientation of the economy, increasing volumes of the domestic commodity market, low inflation, and increasing skilled and highly motivated labor due to the effectiveness of such institutional factors as the public administration system, the legal framework, credit and financial system to support exports and imports. The high rate of accumulation in China is perfectly combined with the lowest inflation in the world, carefully regulated by the government through monetary and administrative measures, favorably influencing the country's investment climate and economic growth. Berger Ya M. China's economy: the difficulties of the real and imaginary. 2011;9:81–92. Salitskii AI, Tatsii VV, Tomberg IR. The Chinese model of development: new features. 2012;5:43–50. Salitskii AI, Tatsii On the characterization of the Chinese model of development. 2011;6:86–91. Leksyutina Ya V. China in BRICS: participation motivation. World Economics and International Relations. 2014;4:81–89. Kadochnikov P, Ptashkina M. Liberalization of foreign trade in China: meeting the challenges of the beginning of the 1990s. 2014;6:103–113. Barney Jay. Firm Resources and Sustained Competitive Advantage. Journal of Management.1991;17(1):99–120. The Global Competitiveness Report. World Economic Forum. World Economic Outlook Database. 2018. Mozias PM. Institutional shifts in the transition economy: the Chinese version. Financial business. 2015;1:53–60. Wu Xinbo. Understanding the Geopolitical Implications of the Global Financial Crisis. The Washington Quarterly. 2010;33(4):155–163. Su Hao. Harmonious World: The Conceived International Order in Framework of China's Foreign Affairs. In: China's Shift: Global Strategy of the Rising Power. Tokyo: The National Institute for Defense Studies. 2009:29–55. Yuan Peng. A Harmonious World and China's New Diplomacy. Contemporary International Relations. 2007;17(3):1–26. World Bank of National Accounts Data. OECD for National Data File Accounts. He Jianwu, Li Shantong, Polaski S. China's economic prospects 2006-2020. Carnegie papers. Trade, equity and development program. 2007;83:56. © 2019 Ali et al. This is an open access article distributed under the terms of the Creative Commons Attribution License , which permits unrestricted use, distribution, and build upon your work non-commercially.